The longest competitive day of the event, Thursday offered more than 300 kms of competitive stages. Opening close to Mildura with the long and fast Belah stage, the crews in the Sunraysia Safari then moved on for two afternoon stages run between Nearie Lake and Ellerslie. 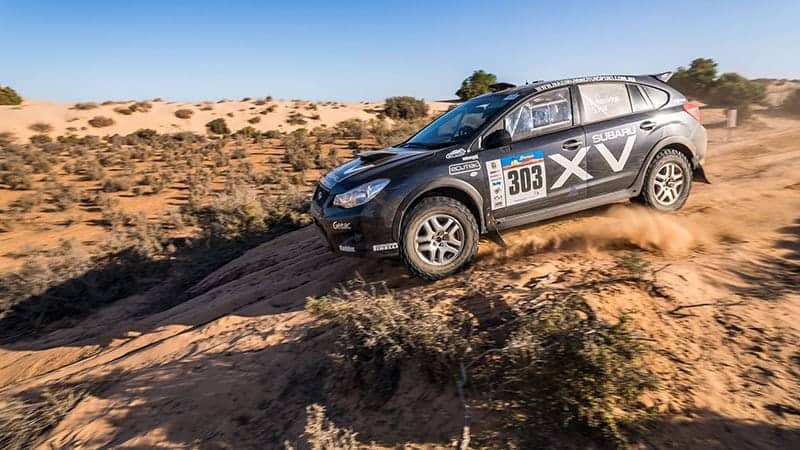 “It’s been a pretty long day”, Rob Herridge revealed after he and the Maximum Motorsport crew finished evening service on the Subaru XV. “We’re holding our own against the purpose-built buggies and ‘hero’ trucks, but today has been tough. We were 15 km into the first stage and the clutch started slipping. We found tonight there was a leak from the input shaft into the clutch, which we’ve fixed. “But we’ve had to nurse the car along all day, and consequently we’ve lost some time and positions. “The first stage of the day used a lot of the same tracks from the first day. It’s pretty tricky to navigate and the tracks are deep sand in a lot of places, so it was hard going with a slipping clutch. Once we got further north, the tracks were harder packed and better suited to our car. But by then we were having to manage the clutch. “I can’t be too disheartened by today; this car is a ground-up build in its first event. So considering we’re matching it with buggies that cost three or four times what the XV does, we’re really happy. Friday is the penultimate day to the Sunraysia Safari for 2018. The morning holds the 90km Kelso stage as the crews head north-east of Wentworth, then further east into the Mungo National Park for a 127 km stage around Mulurulu Lake. After the midday service stop the Wilkurra stage takes competitors north of Mulurulu Lake before returning west to Pooncarie for the short Tarcoola stage.